Members of the Pacific Coast Collaborative (PCC), in particular, the states of California, Oregon, Washington, and the province of British Columbia, commissioned this study by GLOBE Advisors and the Center for Climate Strategies in 2011-12. The report, released in March 2012, identifies opportunities for accelerated job creation, investment, and market capture in each jurisdiction by leveraging the potential of the emerging West Coast “clean economy” through the power of regional collaboration. 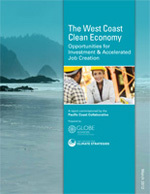 The clean economy job opportunities presented in this report were quantified using proven methodologies that allow for the identification of “clean” or environmental industries and occupations across a number of key sectors, as well as for a consistency in the comparison of numbers across all of the West Coast jurisdictions. Employment growth estimates, GDP contributions, and investment projections presented in this report are net, and take into consideration anticipated growth and shifts within the existing economy. The report is a forward-looking assessment of what is and what could be as the West Coast region progresses toward a cleaner, lower-carbon economic future. The report provides practical guidance on how members of the PCC can work together to create what ultimately will be the West Coast region’s single most powerful competitive advantage – a cleaner and more sustainable economy. The clean economy is the single most important global opportunity on the medium-term horizon, with revenues expected to reach US $2.3 trillion by 2020 (HSBC 2010). The West Coast region, which is globally competitive with other global economic powerhouses, is ideally positioned to realize the economic, social, and environmental benefits of clean economic growth. The transition towards a cleaner economy is well underway throughout the West Coast region with a GDP contribution of US $47 billion and 508,400 full time equivalent (FTE) clean jobs in 2010. It is estimated that up to 1.03 million net new FTE jobs can be created between 2010 and 2020. GDP contributions of up to US $142.7 billion and increased investments of between US $147-$192 billion are also possible during this period. Five high growth clean economy market opportunity segments exist: Clean Energy Supply, Clean Transportation, Energy Efficiency & Green Building, Environmental Protection & Resource Management, and Knowledge & Support. Regional collaboration will allow the leveraging of each jurisdiction’s strengths to create a strong, globally competitive market for clean technology products and services. Leveling of the playing field for clean energy, energy efficiency, and clean transportation solutions, as well as the true costing of carbon, is essential to achieving clean economic prosperity. Accelerating the transition to a cleaner economy requires vision, leadership, and coherent, economy-wide, strategic approaches. The opportunity cost of inaction related to climate change adaptation are too great to be ignored and the employment growth opportunities in related infrastructure, planning, research, monitoring, and innovation too important to be overlooked. The PCC clearly has a strong foundation upon which to build a prosperous and globally competitive clean economy but it will require a long-term public policy approach.